Technically speaking, Pet Sematary, directed by Kevin Kölsch and Dennis Widmyer, has a sheen that the original film (which hasn’t aged all that well in certain aspects) lacks. The woods that surround the Creed family home, where most of the story takes place, are full of lovingly-photographed trees that murmur, whisper, and shriek, as well as mist that rolls out anytime there’s a need for extra-spooky atmosphere. Even though the Creeds—dad Louis (Jason Clarke), mom Rachel (Amy Seimetz), and kids Ellie (Jeté Laurence) and Gage (Hugo and Lucas Lavoie)—have relocated to rural Maine from Boston in order to enjoy a higher quality of life, the place instantly feels ominous. One of the first things they discover about their new property is that it includes the town’s generations-old pet cemetery, and things begin to shuffle downhill from there. Just doing some casual grave robbing. From the start, Pet Sematary is battling against the fact that the book and the earlier movie (a fairly faithful adaptation, with a script penned by King himself) are already extremely well-known, especially the biggest story beats. We know the friendly but sad-eyed elderly neighbor, Jud (John Lithgow here, Fred Gwynne in the original), will let Louis know about a very special part of the forest where things that are buried will come back to life, and that Ellie’s beloved cat, which falls victim to what’s essentially an 18-wheeler superhighway cutting through the countryside, will demonstrate why that’s not such a happy miracle. We also know that same road will claim one of the younger Creeds, and that a devastated Louis will make a terrible choice that he soon lives to regret. 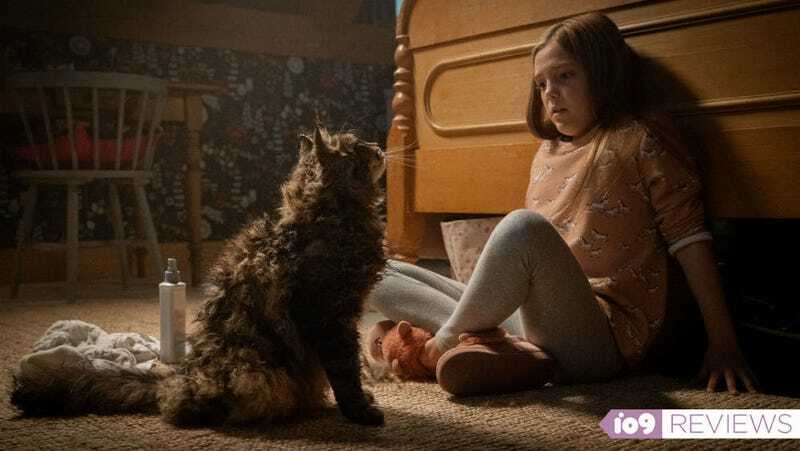 Unfortunately, we’re also already aware of Pet Sematary’s boldest shake-up of the original story, because it was fully revealed in one of the trailers: This time around, it’s 9-year-old Ellie who dies and returns, rather than toddler Gage. There are advantages to this decision, the main one being that Laurence is a gifted child actor who deftly embodies both “kitty-loving cutie” and “scalpel-wielding hellspawn.” Because of her, it makes sense that the movie spends a bit more time with Ellie after she lurches from the grave, as her behavior spirals from weird to homicidal. The downside of expanding Ellie’s role, however, is that Pet Sematary is then robbed of one of its most purely horrifying characters, Undead Gage. Spooky tweens are a dime a dozen in horror movies, but spooky tots who can barely chortle out “da-da” but still have the power to decimate full-grown adults are far more rare. Really, though, the less-scary Zelda is part of a much bigger problem, which is that Pet Sematary just isn’t all that scary, period. Though it draws its emotional heft from the dreadful notion of a parent enduring the death of a child, it doesn’t really poke into the sorts of larger ideas that’ve propelled other recent horror movies about families, like Us and Hereditary. We get one big conversation about how Louis and Rachel disagree on what happens after you die—he’s an atheist, she believes in an afterlife—that seems like it’s trying to hint at the film’s deeper meanings, and then Louis tosses aside his “rational doctor man” routine as soon as his judgment becomes corrupted by grief. This movie ain’t perfect, but Lithgow can do no wrong. There’s something else at work, too, which gets unpacked when Pet Sematary decides it needs to offer more exposition about that cursed burial ground beyond “the ground is sour.” Louis spends all of five minutes Googling local history, and we get a little bit of information from lifelong resident Jud, who knows that “local tribes” fled the woods generations prior and never returned. He also once buried his own childhood pet you-know-where, and realizes all too well how the land exerts control over anyone who comes into contact with its power. Makes sense, really—why else would he encourage his new neighbor to bring a cat back from the dead, all the while fully knowing the chaos that would follow? I was almost hoping Pet Sematary would find a way to make the Jud character secretly evil, but that’s not the last-act twist the movie ends up springing. And since that was just about the only thing in the movie that even sorta surprised me, I obviously won’t spoil it here. Pet Sematary opens tomorrow, April 5.